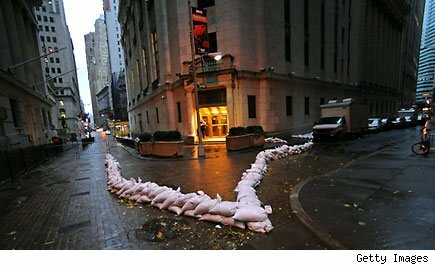 With Hurricane Sandy approaching landfall in the Northeast, the major stock exchanges didn't want to take chances. There were no stock orders executed on Monday. There will be no trading on Tuesday, either. This is the first time since 1988 that the markets have resorted to a weather-related shutdown on back-to-back days. The plan, for now, is that have trading commence on Wednesday. Trading can resume electronically on Wednesday in the event that the New York Stock Exchange is physically closed, but it won't be until late Tuesday that a decision there may be made. As you can imagine, many of the companies that were set to report on Tuesday -- especially the ones in the storm's potential path -- are taking a breather. Sirius XM Radio (SIRI) was supposed to Tuesday morning. The New York-based company chose to bump its report to Thursday morning instead. Others have followed suit, and rightfully so. It's not as if investors can trade on the positive or negative news until the exchanges reopen. When the trading bell rings again you can be sure that there will be movement in hurricane-related stocks. Insurers may take a hit, especially if the problematic windstorm's damage proves to be more severe than originally believed when the markets closed last week. One can expect shares of home improvement chains and the makers of generators to go the other way. Hardware superstores Home Depot (HD) and Lowe's (LOW) are naturally busy selling plywood and other essentials before storms hit. They are also there for roof-covering tarps and other repair supplies after the storms move on. If major pockets of the Northeast suffer prolonged power outages, Generac Holdings (GNRC) -- a maker of power generators -- will also be a big mover. Naturally investors, particularly those in the Northeast, have a lot more to worry about than the way that some stocks will move when trading resumes. Staying safe is the top priority. However, the grim reality is that events do in fact move stocks. It's going to be a slow financial news day with the exchanges closed, but the video game industry is hoping to get a boost with the release of Assassin's Creed 3. The highly anticipated fighting game isn't put out by a publicly traded developer. France's Ubisoft is the publisher. However, when you see Best Buy (BBY) opening their stores early -- unlocking their doors at some locations at 12:01am -- you know that plenty is riding on the release. Motley Fool contributor Rick Munarriz does not own shares in any of the stocks in this article. The Motley Fool owns shares of Best Buy. Motley Fool newsletter services have recommended buying shares of The Home Depot. Motley Fool newsletter services have recommended writing covered calls on Lowe's Companies.